The Congressional game of Chicken is over, and the Republicans blinked. I'm not blaming them for standing against the folly that is ObamaCare (aka The Affordable Care Act), but I am saddened that no one has learned anything from the experience. Disaster has been averted, but only until February 7 of next year, at which time ObamaCare will have kicked in, and nothing short of an act of God will be able to stop it. Well, OK, good old-fashioned common sense could work too, but that left Washington, DC long before I was born. There was also accountability. The Apostle Paul stressed to the nascent churches that while they were to help each other, layabouts should not be given handouts. Lazyness is against Bibllical teachings, so it should not be sanctioned or encouraged. There was also no Social Security or Medicare for the elderly. Instead, if there was no family to help, the church would take on the responsibility to care for the widows, orphans, and others who had no means of self-support. So how did we get where we are today? Wasn't this country founded mainly by Christians who likewise had little support from their respective governments and had to learn to rely on each other? True enough, but as our society became more and more secular, people abandoned their support systems right along with their Creator and Savior. Who else could fill the gap, but a government prone to overstepping its Constitutional purpose? Believers in Jesus Christ are responsible to first use the resources He has given us to meet the needs of ourselves and our families. When a need occurs that exceeds what He has provided, other members of the Body of Christ should show His love by using the resources God has given them to help in the same way they would want to be helped. The local church should be the next “line of defense” to provide for the needs of its own members. SMI is intended to support and supplement this work of the local body, not replace it. We seek to avoid undermining what should be done locally. We also depend on the leaders of the local church to provide accountability for the SMI members under their care. Supporting those who are in need is a deeply-rooted Christian principle, but so is accountability. The Lord knows people's hearts, and only when His Holy Spirit is welcome inside, can we achieve a society that uses its God-given resources responsibly and that takes care of its truly needy members. As I write this, the Congressional debates, political posturing, and media coverage over the shutdown and upcoming debt default continue. To try to understand where our money is coming from and where it is going, I referred to our 2012 1040 tax instructions, which contain the pie charts below. Look at the Federal government's 2011 income, on the left. 36% is borrowed!!! How long could any of us manage to live by borrowing more than a third of our income??? Most of that is in the form of IOU's to domestic entities and savings bonds (probably), and some is borrowed from foreign nations. We owe China more than $1.25 TRILLION!!! On the right side, of course, is the spending. Of that entire pie, 68% consists of various kinds of benefits programs, which a large percent of our population has come to expect from the government. The Affordable Care Act (aka ObamaCare) will make the problem even worse, adding to that percentage, while increasing our taxes, in a foolhardy attempt at making up for its costs. The rest of our annual spending consists of 24% alotted to the military and related expenses, 6% for interest on the $16 trillion national debt, and 2% for law enforcement and general government. We all know there is a significant amount of waste, much of it a direct result of twisted politics, such as the practice of attaching money for pet projects to bills, in order to attract more votes. But there is also very little oversight in determining who should receive money, via the various benefit programs. While there are many who genuinely need the help, there are probably as many who take advantage. For example, people I know have told me they choose not to work, because their unemployment benefits pay as well as any job they can get. Others learn to work the system, continuing to receive money long after they're no longer eligible. There simply isn't enough oversight, but it's probably cheaper to suffer the abuse than to spend additional resources to stop it. As I type this, the U.S. is preparing to enter Day 8 of the government shutdown that has furloughed hundreds of thousands of government workers, shutttered offices and parks, and delayed or stopped benefits to millions. Some folks are even being (temporarily) evicted from their vacation homes that are on Federal land. What's worse, we're less than two weeks away from defaulting on debts, unless Congress passes a bill to extend the debt ceiling so we can pay those bills using money we don't have! How did we ever get into this mess? Is this what the Founding Fathers intended? The reason we're running such an astronomical debt is that our government is spending way more than it is raking in. And then it pays its "credit card" debts with another "credit card." If the U.S. was a person, such fiscal practices would not be sustainable! Yet, we outspend our income an average of $30 billion a month! A previous generation of legislators had the sense to require a debt limit, presumably to reign in national borrowing, but that's just a paper ceiling, since all Congress does now is increase it whenever we need to borrow more. That's like me calling our bank every few months to ask for a credit line increase, even though I'm unable to keep up with payments. This is a complex issue, with a very rich history. While I do know some of the events that brought about the political practice of threatening to shut down government, as a tool for wrestling over bills and measures, this is not what I want to talk about. What really irks me is how involved every level of our government has gotten into our lives. One of the reasons this shutdown is making such big news is that so many people and services are affected. When the Founding Fathers put the Constitution together, their intent was that the Federal goverment mainly provide for a national defense and represent our interests abroad. Most of the day-to-day operation was left to the individual states, which were intended to be far more independent than they are now. 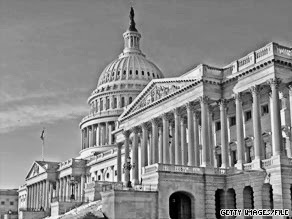 Congress met only a few weeks out of the year, leaving the states to handle their own affairs. By the way, the picture above has a very interesting connection to the current situation. 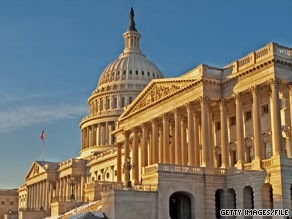 In preparation for this post, I decided to Google pictures of the Capitol Building in Washington DC. 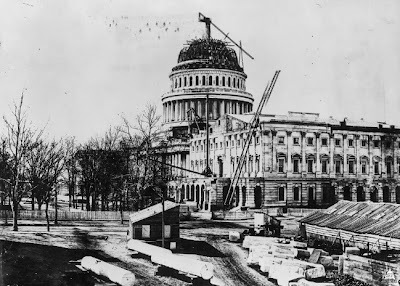 When I saw this photo of the dome under construction, it surprised me, because I did not think photography was available that long ago. But then I read the story behind it. Turns out the original dome was made of wood. In 1855, it was decided it was too much of a fire hazard, so it was torn down, and a new iron dome was commissioned. When the Civil War broke out in 1860, the U.S. government warned the builders that they would not be able to pay them until after the war. Surprisingly, the builders decided to continue construction anyway. President Lincoln saw this as an encouraging sign that the nation would endure, due to the hard-working spirit of its citizens. Ironically, Federal employees are now forbidden from working without pay. Go figure!